Create Your Brand From Start To Finish With My Ebook + Workbook! Hey friends! Today I'm sharing a Squarespace DIY. As you probably know I love Squarespace and I'm always looking for new ways to spruce up my site. 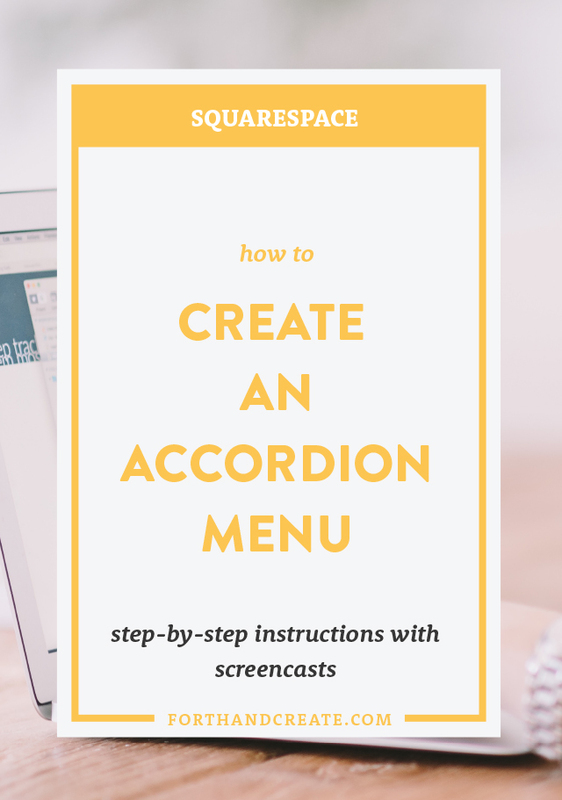 I recently came across this code to create an accordion menu while designing a clients website. This is a great tool to use if you have a lot of info that you want to compress to avoid taking up too much space on your site. You can use it for FAQ's, course module info, really anything that needs to be broken up into sections. Before you become overwhelmed with the thought of touching code, lemme tell you, it's easy peasy and I'll walk you through it. and insert it into your site-wide Code Injection. You can find that by going to, Settings > Advanced > Code Injection and paste the code into the header section. Below is a screencast to better show you. To do this go to whatever page you want the accordion menu to sit and click the settings wheel > place the code in the Page Header Code. Check out the screencast below. After you've entered all your info make sure to save and refresh, you should then be able to see it in action. If you want to add the border around each question I'll show you how to do it below. If you are having trouble with this code make sure you have copied all of the code properly. If you miss something it won't work. If you are still having trouble make sure you have pasted the code into the proper section on your website. Read the post again and give it another try. If you still need help contact me and I can go into your website for a small fee and set up your menu. Shop templates, workbooks, stock photos and more! How to Design a Logo You Love. Plus a free workbook to help!